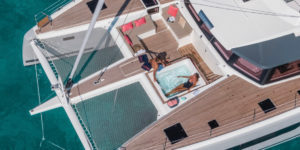 Fountaine Pajot launched the Asia premiere of the MY 40 powercat and the enormous Alegria 67 sailing catamaran at the ninth Singapore Yacht Show, while the French builder also showed a Lucia 40 in a big edition for multihulls. The world premiere of the MY 40 was held in late January at Boot Dusseldorf in Germany. 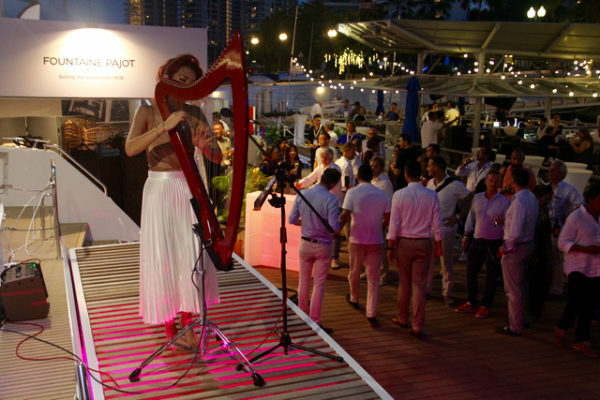 A Lagoon Seventy7 destined for China was another star of the show – hosted by ONE°15 Marina in Sentosa Cove from April 11-14 – and exhibited along with the Lagoon 50 and 40 models that also premiered at Cannes in 2017, as well as a 450F. South Africa’s Leopard also had a biggest multihull display, mixing the 51 PC and 43 PC powercats with its 50 and 40 sailing models, while the popular Aquila 36 built in China and the solar-electric Silent 55 from Austria were also among powercats. The show was also full of Asia premieres including the Azimut Grande 25 Metri, winner of Best Motor Yacht in Asia (25-30m) at this year’s Christofle Yacht Style Awards in Phuket and one of two Grande models that premiered at the Cannes Yachting Festival last September. was among five Azimuts on display, along with an 80, 66, 60 and 55 from the Italian yard’s Flybridge collection. 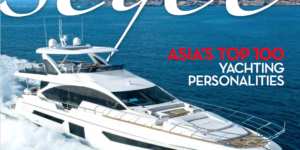 Azimut is represented in Singapore by Hong Kong-headquartered Marine Italia. Fellow Italian builder Ferretti Yachts also had a strong line-up. 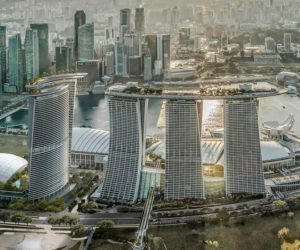 The 920, the yard’s second-largest model, made its Singapore debut and was the largest model in the brand’s five-strong display coordinated with local dealer Hong Seh Marine. The 850 and 780, the brand’s third and fourth biggest models, were also in the water along with the 550 and 450, the yard’s two smallest builds. The stunning Riva 76’ Perseo is another product of the Ferretti Group and was also on display. The Sanlorenzo SD126, the flagship of the Italian yard’s semi-displacement range, was also among the Asia premieres at the show and one of the biggest yachts on display at almost 38m in length. The Sanlorenzo SL86 also made its show debut in Asia and sat beside the SD126 in a display organised by regional dealer Simpson Marine, which worked with multiple brands at the show including Italy’s Monte Carlo Yachts, displaying an MCY 86. Princess is traditionally among the biggest exhibitors at the show with dealer Boat Lagoon Yachting and this time the Plymouth builder held three Asia premieres: the Y85 and F45 that debuted at Boot Dusseldorf in January, plus the 50-knot R35 that debuted at Cannes. The Princess display also included a 30M from the yard’s superyacht range, a Y75, an S65 and the F70, F62 and F55 from the flybridge class. The Palm Beach GT50 cruiser showed in Asia for the first time after its world premiere in the US last September. 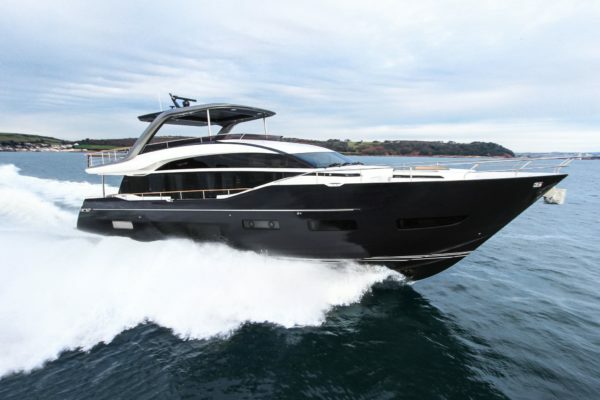 As well as Princess, the British presence was strengthened by Sunseeker, who exhibited a 76 Yacht and a Manhattan 66 as the Poole builder made a return to the show in partnership with new dealers. Furthermore, Fairline is displaying its Squadron 53, an Alberto Mancini design launched in 2017. 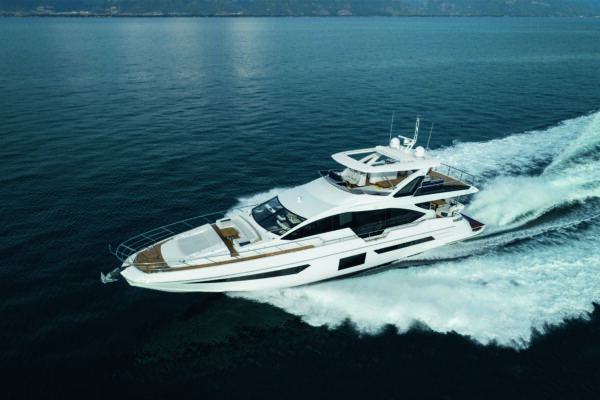 The Prestige 630 was among the biggest boats displayed by French builders including others from within the Beneteau Group. 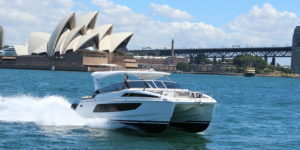 The line-up of Beneteau motorboats featured three models from the Gran Turismo series – the GT50, GT46 and GT40 – along with an Antares 8 and Flyer 7.7 Sundeck, among the show’s smallest models. 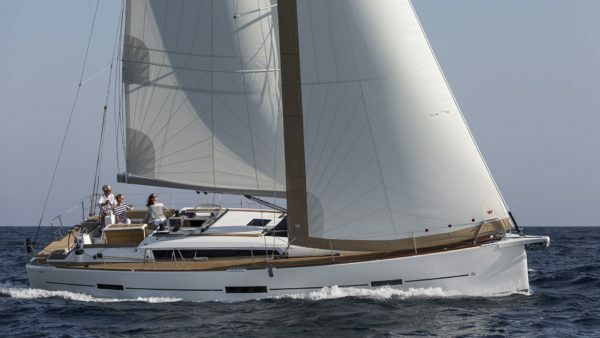 Sailing monohulls included the Dufour Grand Large 460 and Jeanneau Sun Odyssey 440, also from French yards. On land, Italy’s Benetti again had its own booth, while fellow superyacht builders Lurssen, Amels, Benetti and SilverYachts exhibited in the main pavilion. It wasn’t all about big boats. Along with the Antares 8 and Flyer 7.7 Sundeck, boats under 11m include the Jeanneau Merry Fisher 895, two Boston Whalers and a Silvercraft 36 HT and 31 HT from UAE shipyard Gulf Craft. Superyachts included the 59m expedition vessel Seawolf – bound for Antarctica later this year – the 40.35m Lurssen Be Mine (formerly Leonora) and the 40m Thailand-based La Numero Uno, the first Perini Navi sailing yacht ever built.